Words Geoff Baldwin Photography Luke Ray. In 2015, Luke and I made a return visit to Indonesia. We’d had a taste of the Indo custom scene when we attended Kustomfest in 2014 and we were hungry for more. The main objective of our visit was to uncover some of the custom workshops we’d heard about at Kustomfest and to shoot motorcycle features for Fuel’s two wheeled equivalent, Tank Moto Magazine, most of which you’ll find in the latest issue (#07). Our itinerary consisted of a quick two day visit to Bali before heading to Jakarta for five days and our first stop was Nicko Eigert's ‘Smoked Garage’. After the six hour flight from Melbourne to Bali we headed straight to our hotel to unpack the camera gear and arrange transport to the Smoked workshop. When we arrived at the workshop the doors were closed, but Nicko had informed me that they were on the roof of the building next door, which he described as “the one with the aeroplane on the roof”. Sure enough there was indeed a plane on the roof of the building, or at least the huge tail section of a Boeing passenger jet. As we walked up the last few stairs and stepped out onto the unusual architectural anomaly we were greeted by Nicko who was sitting atop his Bronco. Surrounding him was a film crew and photographer and before we could even take in what was about to happen, he lit up the rear end with a killer, full throttle burn out. As I stood grinning like a fool engulfed in plumes of white smoke Luke was frantically scrambling to get his camera out to capture the moment. To Luke’s disappointment it was all over too soon, however Nicko quickly put his mind at ease with a promise of a few repeat performances before the day was over. The build of the Bronco began with a personal challenge Nicko set himself and his workshop team. Smoked Garage have been building customer projects for some time and Nicko wanted to build something that would really test the skills of his team and prove his workshops ability. With the recent unveiling of the Lotus C0-1 and all the hype it generated, he decided to build a bike influenced heavily by the Lotus design using the skills and the resources they had available to them. Thankfully around about that time a member of Australian Rugby League team the Brisbane Broncos, expressed interest in owning a Smoked build and the idea received the backing it needed to get underway. After some research into which modern bikes were available locally and which ones would suit the build, a 2014 Kawasaki ER6N was acquired. When the bike arrived at the workshop the team were gathered to inspect it and according to Nicko, everyone's unanimous reaction was "where the hell do we begin?". 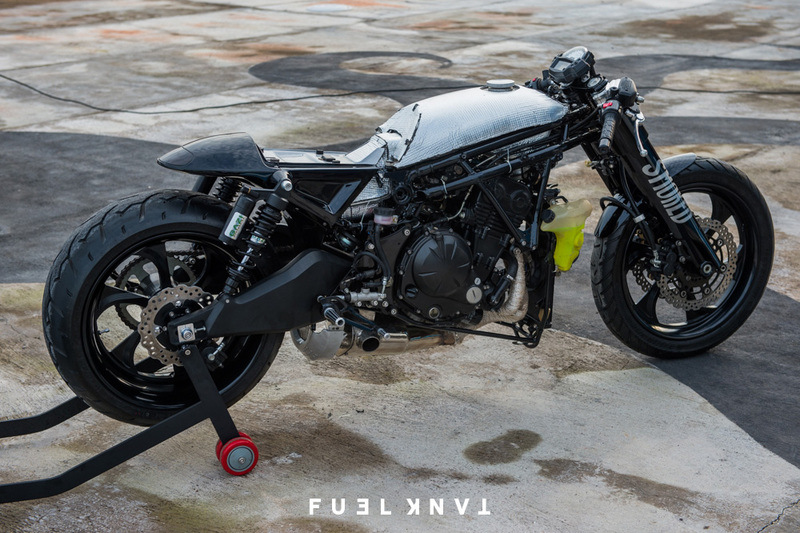 The team now had the huge task of transforming a naked, sports bike into a fully faired, jet engine looking machine that would handle and ride perfectly despite dramatic changes to its cooling system, suspension and dimensions. When the head scratching ended it was decided the best approach was to simply get on with it so the bike was stripped down and set up on a jig so the modifications to its frame could begin. Rather than building a new frame from scratch they decided to build onto the existing one, removing sections of the stock frame as they became redundant. This allowed them to retain the stock engine position, basic geometry and engine mounts while testing each modification as the frame evolved. With the frame completed a reputable local metal worker, Gus Wi, was tasked with the mammoth job of shaping the bodywork. The five piece aluminium body was formed by hand and bolted to the frame using flush mounted screws creating an aeronautic look well suited to the design of the bike. Each panel was then painstakingly sanded by hand in one direction to create its brushed appearance before being pinstriped and clear coated. The new rims were modelled in 3D and approved by an engineer prior to being milled by a factory in Jakarta. The larger wheels (19 inch front and 18 inch rear) and custom made swingarm necessitated a new sprocket combination for comfortable gearing on the Australian roads where it was destined to live and the drive shaft was modified to align the chain on the front and rear sprockets. By now word of the build was beginning to spread thanks to a few leaked images on Instagram and much to Nicko’s pleasure other brands were keen to get involved. “Pirelli provided the rubber for the bike when they stumbled across the build online along with Aussie suspension experts 'Gazi Suspension' who provided the rear piggy-back style shocks”. With the help of a local nightclub owner’s smoke machine the aerodynamics of the bodywork were tested in a makeshift wind tunnel. Nicko's initial concerns about cooling were quickly confirmed when the front wheel prevented enough air from entering the massive front scoop. To keep temperatures at safe operating levels additional ventilation had to be added. Strategically hand drilled holes above the front grill help to direct air onto the radiator and the ones behind the side scoops help draw air in around the exhaust system where temperatures were reaching alarming levels. With the bodywork, fuel tank and airbox all constructed of aluminium, heat transfer was also becoming an issue. To tackle this the internal surfaces were lined with heat shielding material, but it was discovered that the temperature issues were worst when the bike was parked after riding. Once the airflow over the exhaust stopped and the water pump ceased to circulate coolant, temperatures inside the bodywork were reaching dangerous levels and the bodywork became almost too hot to touch. Again using their creative ingenuity the Smoked team devised a cooling system using a series of internal fans controlled by a turbo timer. Now when the bike is parked and the ignition is switched off the timer runs six fans on a timed cooling cycle, keeping internal temperatures at acceptable levels while the engine and exhaust cool. Most of the Kawasaki's original wiring loom was able to be retained. A custom fuse box was made to sit beneath the seat for easy access and concealed in the front cowl and tail section are custom made LED lights. Inside the bodywork you'll also find a full custom stainless exhaust system with a belly mounted muffler exiting through the bodywork just beneath the right foot peg. Inside the ‘Smoked’ fork shrouds the original upside down Kawasaki forks are kept true with an elaborate internal bearing system that prevents any surfaces from rubbing. To keep the raked front end under control a steering damper was added and believe it or not the bike will be roadworthy and registered in Australia! All up the Bronco took a team of seven people three months of twelve hour days to complete.The Smoked Garage version of the Lotus C0-1 may not be powered by a 175bhp KTM RC8R v-twin, but its 650cc ER6N inline four produces a respectable 85bhp at 8500rpm. As we witnessed on the day, that's more than enough to have some fun with and quite frankly this is a bike best ridden at slower speeds for everyone to admire. This article first appeared in Fuel Magazine issue 20.